Did you know its only 39 sleeps until Xmas? If you’re lucky enough to have people in your life who love hand-crafted gifts, then its a very busy time of the year! And i’ll be honest – financially its a bit tight this year (a mortgage all by myself, in Sydney the 2nd most expensive place in the world to buy a house) so spending time instead of money on my loved ones is doubly important. I feel a bit sad that most of modern society values bought presents over hand-made, I know I would be delighted if all my friends made me something instead of contributing to the capitalist machine! 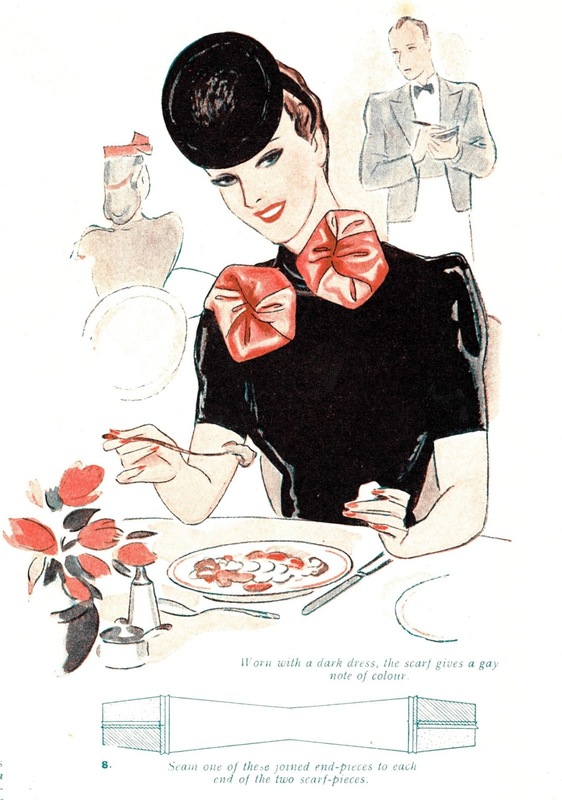 Over the next week i’ll be sharing some posts from the late 1930s to mid 1950s, featuring pretty, zany and practical items to make for loved ones – or just yourself. I hope you enjoy them! Starting with…. Just Like Two Silk Flowers! 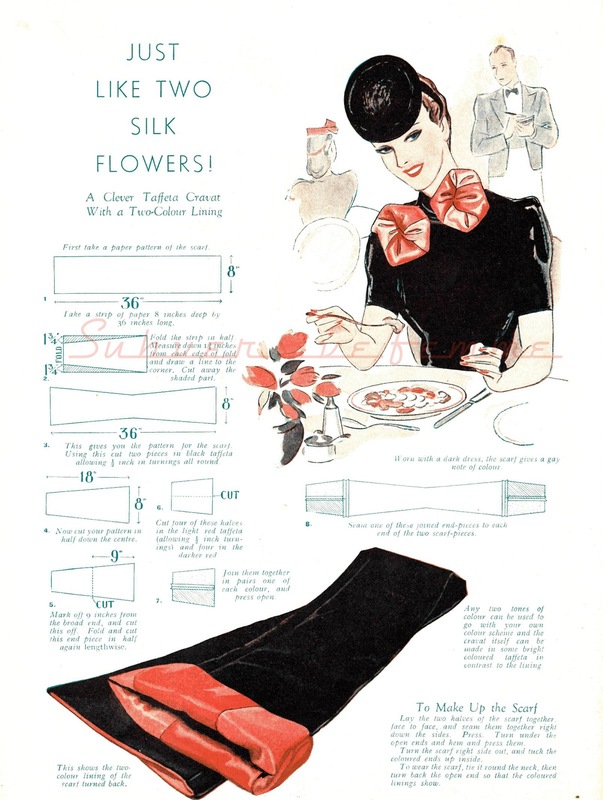 This unusual cravat is made from a tube of black taffetta, with a contrast lining folded back to resemble flowers. From Good Needlework Magazine, October 1939. Very easy to make – and very striking! All quiet on the home front. What a creative and colorful idea! I've pretty much finished all of my families' presents. My mom gave me a ton of yarn so I made scarves, hats and gloves for everyone. I enjoy making presents for families because 1) it's one of a kind and 2) it's more pratice for my knitting. I am planning to make aprons for some of my presents – inexpensive and useful too. I just hope they like them as much as I do. A handmade gift is so much better than a bought one that is the same as 1000's of others. We're doing as many homemade gifts as will be appreciated. Lovely pictures in your post, very festive – only 39 sleeps!! Exciting! I'm trying to do all handmade this christmas.. it's a lot of work, but I'm hoping it'll be worth it! I'm double lucky because my family appreciate hand made gifts and also make them for me! I agree, there's no need to join in with the consumer frenzy and it's so much more rewarding once you opt out. I'm going to try that cravat idea! Thank you.